If you like sharing your photographs online, whether on Facebook or on your own blog, you should learn how to properly resize your images in Lightroom. While your camera can take very high resolution photographs, it is always a good idea to down-size or “down-sample” those images, not only because most websites won’t accept large images, but also because making those images smaller will actually make them look better, if done correctly. In this quick tutorial, I will show you the proper way to resize images in Lightroom. A separate article on how to do this in Photoshop can be found in my “how to properly resize images in Photoshop” article. I use the below method when exporting images out of Lightroom. 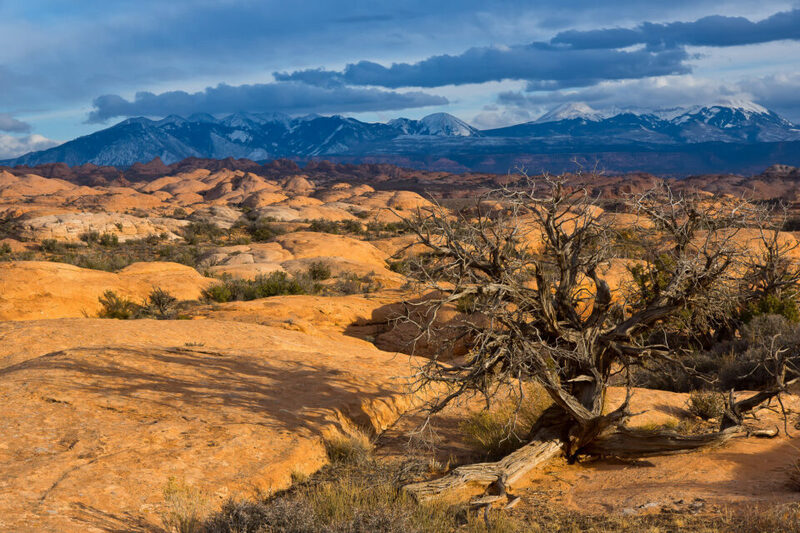 You can employ this technique to any photograph – whether it is a portrait or a sweeping landscape. When I wrote about the benefits of a high-resolution sensor, I used the word “down-sampling” when talking about reducing noise and increasing sharpness in high-resolution images. Right after I posted the article, I got plenty of questions from our readers, asking about what the down-sampling process is like and how it can be done. I then realized that many photographers are used to the term “resizing” and have never heard of the term “down-sampling” before. I often use the word “down-sampling”, because “resizing” applies to both increasing and decreasing image resolution (and hence its size), while “down-sampling” only applies to reducing an image. 1) Why Resize / Down-Sample Images? Why would you want to resize an image? Your camera is a very advanced tool and it contains millions of pixels. This is good if you want to print your images, but what if you want to share those photographs online? Many websites won’t even let you upload high resolution images, while others like Facebook will down-size them for you, automatically lowering the resolution and quality of those photographs. Because this automated photo reduction process is often not optimized for best quality, it can make your resized photo appear soft and might even result in loss of colors. To prevent that, it is always a good idea to properly resize your images before you use them online. This way, you are in full control of how your photo should look. I use the above process most of the time and resort to my much more complicated Photoshop resizing process only when working on select images that I want to showcase. Let’s me go over each section. Start out from “Export Location” and start out by choosing “Specific folder” from the drop-down. Next, click the “Choose” button and select a folder on your computer where you want the exported files to go. I set mine to “Lightroom Export” but you can choose whatever you want. Some people export to their Desktop and then check “Put in Subfolder” and type a different name every time they export. Whatever works for you. For “Existing Files”, I have set mine to “Ask what to do”, so that the system asks me what to do if a file is already present in my export folder. Under “File Naming”, if you check “Rename To”, your files will be renamed to something different. I usually check this box and select “Custom Name”, then under “Custom Text” I type the name of the photoshoot. For example, if I type “Lisa and Bob Weddding”, then the first file will be called “Lisa and Bob Wedding” and the next files will start with the same name, with a dash and a number added at the end of the file. So it is safe to do this for multiple files as well. “Extension” does not matter – I set mine to “Uppercase”. When exporting images for the web, you should always choose “JPEG” as the file format. Right next to it there is a “Quality” slider. I have seen some people slide it all the way to the right, thinking that it will preserve the best quality. Well, it does, but it also results in humongous image sizes! I typically have set mine between 65 and 80. On rare occasions when I need to print I might pick a higher value, but never for the web. In case you are wondering how this value impacts the image size, try a little experiment. Export an image at 65, then 75 and then at 100 quality and see if you can see any difference between the images. I bet that in most cases, you won’t be able to tell the difference. Now about that size. When I exported an image at 65 and 1024 pixel wide resolution, the image was 65KB in size. The same image at 75 quality created a 74KB file. Finally, 100 quality resulted in a 174KB file! If you thought that going from 75 to 100 should only increase the file size by a quarter, think again! That’s more than twice the size, going from 74KB to 174KB! Therefore, you should never export images at 100 quality. I have never had to use more than 80 quality for my images you see on this blog. Next, set “Color Space” to sRGB – that’s what most monitors on the Internet are able to see properly. Don’t check “Limit File Size To” and you can keep “Include Video Files” checked – it has no effect on images anyway. Under “Image Sizing”, make sure to check “Resize to Fit” – this is what will actually resize the image to a smaller version for the web. I usually set mine to “Long Edge”, which limits the width or height of the image (depending on whether it is horizontal or vertical) to a certain value. That value you set right under, in the first input field. I typically use “1024” pixels, which is a good size for the web, but it is up to you if you want to go smaller or slightly larger. Don’t use a high number here, because it will result in a huge file; plus, most websites won’t allow you to upload huge images anyway. For reference, the first image in this article is 1024 pixels wide when you click and open it in full size. The part that many people seem to be confused about, is “Resolution” under “Image Sizing”. That setting has absolutely no meaning when exporting your photos for the web. You can set it to any number you want, 1 being the smallest and 65000 being the highest numbers you can use. Whatever number you type in, Lightroom will simply write that number into the file as a reference for printing purposes. If anybody decides to print your image, their printer will most likely default to this resolution / DPI setting. But it really doesn’t matter, because DPI can be changed at the time of printing anyway. I leave mine at 72 pixels per inch. The next section is very important. 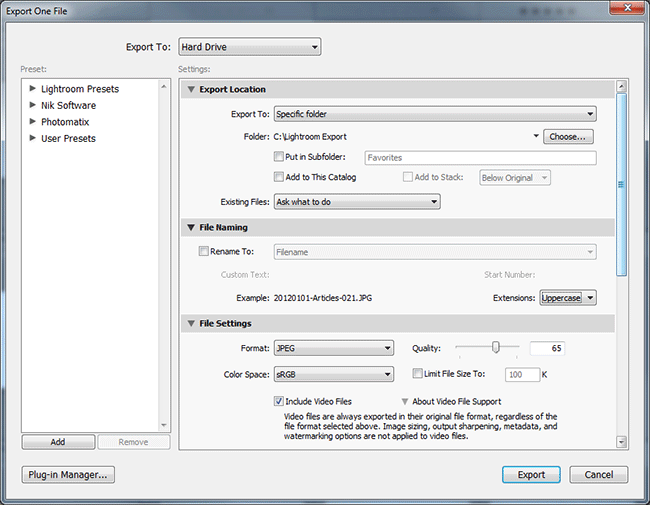 This is where you set the amount of additional sharpening Lightroom should apply to images after they are exported. What you pick in this section really depends on how much sharpening you have already applied to the photograph in Lightroom. If you have no idea what sharpening values to set in Lightroom, see my detailed article on “how to sharpen photographs in Lightroom. I have my Lightroom’s default sharpening set to “Amount: 50, Radius: 1.0, Detail: 50”. With those values, I always set my “Output Sharpening” to “Screen” and I choose “High” for Amount. A “High” value works great for me, because it adds just enough sharpening for my taste. If I perform a much more aggressive sharpening in Lightroom, I choose “Standard” instead, because “High” might be too much. When exporting images for the web, always make sure to check “Minimize Embedded Metadata”. What this setting does, is it strips all of the data embedded to your photographs (such as camera type, exposure settings, Lightroom settings and much more) and removes a thumbnail from the photo. This significantly reduces image size. If you leave this unchecked, people could potentially view not only the camera and exposure information, but also exactly what settings in Lightroom you used before you exported the image. If your intention is to leave some metadata / EXIF information for your viewers, then see my “How to remove EXIF data” article – I show how to selectively strip EXIF data in that article. If you have a watermark you want to use, pick the right one under “Watermarking”. If you want to find out how to add a watermark in Lightroom, see my “how to watermark a photo in Lightroom” article. Lastly, leave “Do nothing” under “Post-Processing”->”After Export”. Once you are done, just click the “Export” button on the very bottom of the window and the image(s) will start exporting. That’s it! The good news is, once you set the settings in this window, Lightroom will always remember them, so you can reuse the settings without having to modify them each time. Nasim, first let me thank you for the wonderful website. It is a great source of knowledge and inspiration to amateur photographers like me. My question is as follows. What would be your recommended resolution (image dimensions in pixels) for exporting photos for watching on FullHD TV? JZ, a full high-definition 1080p TV has a resolution of 1920×1080, so if you want to optimize your images for the TV without seeing any corners, then you need to crop the image for that ratio first. Before exporting images out of Lightroom, go to the Crop tool (press “R” in Develop mode), then where it says “Original” right next to “Aspect”, change it to “Enter Custom”. A new window will pop up where you need to set the correct ratio. Set the aspect ratio to “1.920 x 1.080” then press enter. The image will resize to this new aspect ratio and you can export it with 1920 pixel long size (as shown in this article). Nice article. Aspect ratio for Full HD can be easily set as 16 :9, am I right? This is exactly the info I needed! Easy to follow and do. Thank you! Great post! I already used lightroom to resize images for my travel blog, but I found your way to export better than mine. Can you tell me how do you export your images from lightroom when you want to print them? My main doubt is which value I should use in image sizing and resolution. I like to make large prints, usually in photoalbums, like the ones in blurb. Vinicius, again, the DPI setting is not really important if you are printing yourself. When sending your images to the lab for print, pick a DPI value between 125 to 300, depending on how big you want the image to be. There are too many variables involved when printing, but for the biggest size prints, you should try to export images at their original size (no resizing needed) and you should apply the “High” sharpening method to those high res images. What are the pros and cons of doing it this way instead of with the photoshop method you wrote about earlier? Brian, if you are not doing any sort of retouching on images, then the process is about the same. The Photoshop method is much more detailed, letting you get rid of noise and tweak the sharpening more before you save it. Lightroom has limited functionality (it does not let you pick a resizing algorithm, has a limited number of sharpening output options, etc), but much faster workflow. As I have already said, I use the Lightroom method for most of my photos and only resort to the Photoshop method when I need to produce very high quality images for print or web. Diane, you are most welcome, glad you enjoy the site :) At the end of the day, it is all about the workflow and efficiency. I personally prefer the Lightroom method, because it is much simpler and easier. However, sometimes you have to go Photoshop just because Lightroom does not have the tools I need (as you pointed out). Nasim, thank you for this great article that helped me understand this issue better. I have a question regarding the upcoming D800. There are rumors that it will come in two versions, one with and one without the antialiasing filter. I have a basic understanding of what the AA filter does, but I would like to know your opinion on what the difference between these two versions of the D800 would be in terms of image quality, sharpness and resolution if both have a 36mpx sensor but one doesn’t have the AA filter and what would be your recommendation (with or without aa filter) for someone who wants to do landscapes, portraits and studio work. Thank you. Jorge, I really hope that the rumors turn out to be true and Nikon indeed releases two versions of the camera. I will be buying the version without an AA filter, although will test both extensively. What is an AA filter and why do we have it on most cameras? The answer lies in patterns. A repeating pattern in a tight space results in “moire“, which screws up colors and results in a “rainbow” look that can change depending on the angle. Moire occurs because a sensor is like a grid with pixels in straight horizontal and vertical lines. An AA filter, which is also known as a “blur” filter, spreads the light patterns over several pixels making images appear softer. This technique removes the effect of moire completely, but it also softens the image significantly. Landscape photographers almost never see moire, because tiny repeating patterns are very rare in nature. However, portrait photographers would be troubled by moire, because it is everywhere around us. From business suits to bridal dresses or other textured interior areas. Here is the good news though – there are now more effective ways to remove moire in post-processing. Lightroom 4 will have a built-in feature to remove moire, so it should not be a problem in the future. Thank you so much Nasim, your explanation helps me a lot with my decision, I think I’ll be getting the one without the AA filter too. What puzzles me is why the version without filter is rumored to cost u$900 more than the version with the filter. Any idea? Thanks again!! Thanks for detailed tutorial. I have another question related to image resizing. Often, our primary goal is not to reduce the image dimensions, but make image file smaller. For example one of photo hosting site that I use have a limit of 350K per image. Pixel size is not that important and for web/screen can be between 600 and 2000 pixels wide. Obviously, for larger dimensions would need to use lower jpg quality to fit into predefined file size and at extreme the overall quality will suffer. What is the best balance between pixel size and jpg compression to achieve best quality for giving file size limit? Thank you…thank you gentleman for this wonderful post! It’s helped me SO much to improve my LR skills. Thanks you for this awesome website! It’s just a wealth of information you have here :). Regarding the D800 I’m thinking about getting this camera but I’m concerned about the massive raw filesize. Is there a way to resize the raw images before importing them to e.g. Lightroom or Aperture (I use Aperture)? I know harddrive space is getting cheaper all the time but my disk array would fill up very quickly with 75 megabytes raw files. Nevermind I found out. Looks like you don’t have to shoot at full 36,3 megapixels. Great! Actually the question still stands. Looks like you can’t shoot anything less than 36 megapixels in FX format. Thanks for the explanation and indeed a great site !! I use a canon 5dmark2 and shoot raw , highest setting (5616×3744) so the pict. come out really big . when i check info in finder it says the files are somewhere around 25MB. Now i need the picts for a magazine and they want Tiff files. still i need a good quality of course. I did some basic editing in Lightroom nothing big. On export i did mainly as told above. changed to tif. 300dpi. Checked resize to fit. choose dimensions and changed W+H to 2725×4077 pixels. Assuming doing so my file size would automatically change into something smaller than 25MB. Now when i do check info after export the file suddenly grew to something 62MB !!!!!!!!! This really beats me .. !!??? It takes for ever to send 25 pict with We Transfer (5hours) that way i guess i could have send the original ones instead. What did i do ? did i harm the pict (not the original one of course while working in LR)seriously or just some quality loss by doing this ? And if i change to LR3 because of this , what exactly is happening when you down sample like this . do you loose quality or not. Why in Lightroom they don’t warn as if it is easy to resize while actually it’s really not … ! As you can see , very-very puzzled. I hope you can answer me. Thank you so much for this article. This is an issue I’ve been trying to solve in, like, FOREVER! Finally, someone who explains it step by step and setting by setting! Now for a complete website overhaul! Yet another gem of an article from you. I thought I knew so much about Lightroom, of course now I know it was an illusion ;-) I did play with these settings and experiemented with sizes, etc. – I see no difference in image quality with 65% vs. 75% v.s 85% or vs. 100%. They all look the same but my image size has gone down from 6 MB JPG to 180 KB JPG!!! A jaw-dropping difference. Thanks to you! I’v been following this site for a few months now. I appreciate it a Lot. You wouldn’t believe how much I’ve learned in such a short time. It’s motivating and it encourages me to work out my hobby. This post-processing section allows me to get the maximum out of my pictures. Many ‘secrets’ have been revealed. Great work and many thanx! This is great article, I have played with these settings for a while and really like your recommendations. Im hoping you can help me with one thing though, what changes would be needed, or what would the export look like when exporting for prints? Thanks! Oh, and instead of waiting for the D800 I went ahead and bought a new D700 with the price drop, Im loving it so far. I do have the same question that Jay presented above. Marjorie, the export settings for prints depend on many factors, including final print size and DPI, type of paper, color profile, etc. You will need to work with the printing company to find out exactly what’s needed. Generally, for most consumer printing shops, images are printed out between 150 to 300 DPI and export is selected as JPEG at 100% quality and sRGB color profile. For higher end printing jobs, the process is a lot more involved. I use Lightroom 4 thanks to you and the dropped price Adobe is doing (I do not have Photoshop). I have some D800 files I took from a test body (I preordered the D800e) and I want to down-sample them let’s say to the resolution of the D3s. Do I have to put the width and height of the D3s ( 4 256 × 2 832 ) and will that be OK ? I use Lightroom 3 soon to upgrade to Lighroom 4 when the bugs disappear. Why would it be preferable to use Photoshop than Lightroom to resize to achieve a better outcome for photos? Thanks for this wonderful article. I have Nikon D5100 with a 18-55 Vr kit lens. Before D5100, I had D40 that was performing very good in respect of sharpness. I would like to know which method of resizing will give better result; In camera or computer (bicubic) resizing? Will shooting 16 mp photo and downsizing it to 4 mp on my computer (using bicubic interpolation) give better results compared to direct camera shooting set at 4 mp as per detail and sharpness under same shooting conditions. Do you know which downsampling method is used -during image capture- by D5100 when image is converted from 16 mp to 4 mp? 1- Can I take a 16 mp APS-C sensor set at 4 mp (in camera) as a 4 mp APS-C sensor? I was happy with my 6 mp D40. I wish my D5100 had a 6 mp resolution sensor having todays technology (expeed 2 etc) as I do not need/want 16 mp resolution. 2-For D5100; do the neighbour pixels combine and act as a bigger one when image resolution is set to 4 mp on the camera? If so, is the IQ is at least equal to an originally 4 mp APS_C sensor shot? 3-When you set resolution to 4 mp on D5100, does bayer interpolation is affected/enhanced some way? On my nikon d7000, as far as I know, resizing mp resolution in camera only affects the size of jpg-s. Which means that it uses camera’s software to convert the image to lower res. To me, this means 2 things: 1.) if I use quality software of newer date (LR4, PS CS6) than my d7000, I’d rather let the software convert images than my d7000 since it probably has a better algorithm, and 2.) I much prefer shooting raw where you have full control…yes, it does take a little more time to do the work, but it makes a huge difference at the end. Nice to have a handy quick reference at a time such as NOW when I have a question which is promptly, effectively and emphatically answered! Long live The Mansurovs! Hi, great site for learning! Just wondering, with SO many ways of resizing and high resolution and low resolution can you give me some idea of what is the best to choose in Lightroom 4 for images for printing for clients on a USB stick – I know they should be high resolution JPEGS but I’m confused about the rest of the sizing and pixels etc…..
wow i’m new to lightroom, and this was the first site I found on bulk image resize and export. Fantastic and very easy to follow :D I’ll be reading a lot more on your site ! This is probably the best review I have read on downsampling so far online. You have really set the bar up high for all the reviewers out there. I have also read your article on D800 which is also one of the best one I have read and I was wondering should I use these same parameters for downsizing D800 images? Thank you so much. Hi thank you SO much, I now know what to do to resize for web :) now, what do I do for images going to clients that they may choose to print later???? would really love your help on this :) thanks so much, Jane. working on my website as I type, and stumbled across the site while searching for photosizing advice… this page alone is a gem! thank you! Thanks for this helpful post. My question is more about how to size images for clients. How do you resize you Raw and JPEG files after shoots to create DVD for clients. I am confused on what z=sizes files to give them for High resolution and printing. but doing that the files are at original size and its large files as far as for the web i resize on the lone side at 920 with a resolution of 72 then for print i don’t put in any resize to fit and just change the resolution to 300, but like i said the print option leaves the pics at a very large size…. I use Aperture3, any help on Resizing settings? About sharpening in LR. For Landscape I use something similar with Scenic preset (40 with Radius 0.8). As a comparasion, for faces LR use 35 with Radius 1.4. Good luck and thanks for info. Although I have always been very sure about how I’ve been downsampling my photographs (I use almost the same procedure as mentioned in the article), I just wanted to read how you go about it. Having read this, I want to tell you that you’ve explained it in such a manner that it will become a piece of cake for somebody who is confused how to go about it. Brilliant article again, Nasim! You are awesome! I am a beginner Lightroom 4 using a Nikon 800E (first time, too) and I like this article very much. It allowed me to reduce the size of my pics to post them in Facebook….I have a lot to learn and I’m grateful for your article. I have always liked photography and had a Canon Xi and other smaller cameras. I decided to learn more and get better pics….. I am using mainly RAW images processing software then by Photoshop as PNG files i post them in Facebook.. I will also do and try your way with Lightroom and update! Hi Nasim, thank you for your exceptionally clear and well written instructions. For someone struggling with Lightroom, your post was a true gift. As I try to create my first photo blog, image resizing has been quite a challenge, especially when I’m confronted by huge file sizes for no apparent reason. You’ve really helped. Wow, so glad I stumbled on this site. For years I’ve been painstakingly resizing all my JPEG to near 5MB so they don’t get bounced in email from my employers. The dimension size didn’t matter, so, I knew there had to be a better way of batch processing my JPEGs from the original RAW files. So, on I went looking for a software or technic for a solution. Only once a few years ago I compared the JPEG quality settings, a very low and the highest value, and saw the difference which prompted me to just 100% ever since. I was surprise to find almost no difference at the 65%-80% range as mentioned here. This totally solved my file size problem, thank you. PPI/DPI setting has 0 value for images – it is only valid for prints. Try exporting an image at 1024 pixels with 72 dpi, then export the same image at 300 dpi. Compare file sizes – they will be identical. Imported and converted to DNG into LR I image has dimension size of 3264 x 4912 or 4912 x 3264. Some have been cropped. I am thinking Jpeg Quality 80? Not checking re size to fit and DPI 300? I found your article on resizing photographs very helpful. Now I have another question. I am going to be posting some of my images on a Fine Art site where they will be offer for sale. I am not sure how large the files should be and/or if I should be cropping the file for viewing, i.e., 4 x6, 8 x 10, etc. Are you submitting a digital image of your artwork with 300-350 dpi resolution at 1200X1800 pixels? I’m trying to decide if this software can simply downsize my art photo while maintaining the image quality and using the longest dimension of 1800 pixels. In the end the image size needs to be 4 inches X 6 inches. Are you doing something such as this and is this software useful? Can I resize a RAW file in lightroom 4.3? Like from 20MB to 4MB? First of all, thanks Nasim for this nice website. I had a problem that I have not been able to solve from some days ago. I am trying to export this images to JPEG with dimensions 1820 x 720 (whose aspect ratio is 16:9) for an HD video. However, whenever i export them with LR i obtain pictures of dimensions 1087 x 720. As far as I have understood, LR is exportin in this dimensions to keep the same aspect ratio 3:2. How can I export with a diferent dimension and aspect ratio? Is it possible to do it just cropping the image? Hi Nasim, I’ve got a question that I can’t find the answer to. I understand how to resample pics in CS6 for the web. But I’m confused when it comes to resizing for prints. When I pull a RAW file from my 7d into CS6 under image size it shows it’s 5184 pixels wide and 3456 pixels tall. And under document size the width is 21.6 inches and 14.4 inches tall, with a resolution of 240. That’s before I do anything to it. I’m happy with the pic and want to save it as a TIFF to print. So, I need to make it smaller while still keeping the aspect ratio of 3:2. to make a 6 x 4 print. The problem is when I uncheck resample and scale style and set resolution to 300 and type in 6 x 4 then it shoots my resolution way up to 864. That seems way to high. The only way I can get a 6 x 4 with 300 dpi is if I change it under crop in size and resolution. Though, when I check it again in image size it shows that my pixels got reduced to exactly what they would if I were to resample. Is that basically the same thing? How should I go about doing that? I found your article very helpful. Thank you! I have a question… I would like to sell web only images to my customers where they won’t have full rights, but they can purchase the image and the display it on their website, fb page, etc. By reducing the quality, will this prevent them from taking the files and printing a high quality image? I am wanting to know the same answer….did you ever get an answer? IF so, would you mind tellign me? Nikki, see my response #62 to Pauline. Pauline, you can be sure that the images you have will not be more than 25 MB in size. Simply extract at 100% JPEG quality and the file will be around 5-6 MB at most. Lovely article. I use LR 4 and this article clearly demonstrates what I should be doing whilst exporting. Thanks a ton Nasim. Just one query. Does LR have the capability to interpolate. In otherwords if I do crop an image (sometimes aggressively), will I be able to get an image that is good enough for big prints. I use an 8mp DSLR (1d Mk II). Yes, Lightroom can upscale, but its algorithm is not as good as some commercial solutions. If you want to do something serious, I would recommend Genuine Fractals or similar products. I have a question about the order of my workflow. I import my Raws from my D800 to LR, make adjustments, send them over to photoshop, and the save them as jpgs from photoshop. After that, I reimport all the finished jpgs back into LR so I can double check they’re all straight and have matching color, etc. Byron, I think your last step with re-importing images is a waste – I would skip that. Why check colors on each export? Just use the same consistent settings upon export and you will be good to go. Downsampling should only be performed on export. Since you wrote this, LR 5 has changed the metadata section slightly. “Minimize Embedded Metadata” is no longer an optional selection. What is your guidance considering the LR5/LR CC options? Thanks again for such an informative selection of LR and PS articles. Great article! Question- I imported 3M images into Lightroom3, edited them and then exported as 300K. Later, I wanted to resize UP the already edited 300K image back to 1Meg or higher. Is there a way to do this without going back to the original and rediting/developing in Lightroom3 and exporting at higher resolution? Thanks so much, Nasim! This helps me better understand the correct way to export photos for the web. Never did this before and always had trouble with “resizing” images on the actual web (really distorted the photos). Nasim, Thanks for the great posts, I live in Durango, Co and I use my camera for doing art projects. I print on a epson 3880 and work in Lightroom 5. When I export my photo’s out of lightroom after working on them, I want to save on large file with lots of detail and info as I print the results 22×34 or so. Brilliant article my good sir! A very useful post indeed, resolving an issue I was never completely sure of how to handle. I’m shooting a 24MP Pentax K-3, which will naturally produce pretty big detail-rich DNGs. Applying your settings for resizing in LR5 preserved a crisp look of the images while bringing JPEG file sizes down to web-friendly values. I was dreading trying to figure this out. This tutorial was awesome! Thank you so much. This is the best info I’ve found so far. But I have one problem. When uploading pictures to Twitter those in landscape seem to be blurry (shows most in my watermark) but those in portrait are tack sharp. I used 1024px as the widest length. I’ve found a lot of helpful info on how to resize or downsize your pictures in lightroom to be used in Websharing. However, what if I take a group of pictures for someone and I want to put them all on a cd later for them. They may use these pictures for multiple purposes, including sharing on the Web, making prints of a few of them, and submitting some to be printed onto a page in a yearbook, for example. How then do I size my pictures in lightroom during export? I have to resize for long edge to be 2880 pixels to look correct on my 15″ Macbook Pro screen…..Anything less look pixelated. Thanks for the helpful information. I am still having trouble resizing to exact dimensions for my blog pictures. I input 680×450, but the end result gives me 450×678 – it may not seem like a big deal, but it does show on my blog. I have tried many things but to no avail….. Interesting article. With all due respect, I would like to make a few comments. Personally, I would always save my JPG’s at 100% or close to it. With bandwidth and storage relatively cheap, I believe size is the most important consideration. For instance, you might not need the full size maybe of a Nikon D800 to print out at billboard size. So instead of maybe 36 MP equivalent make it 12 or 16MP equivalent. Yes, you can shrink them much further (in perceived size for storage and rendering) with the compression settings. However though, with JPG being a lossy format you run the risk of showing the compression artifacts a lot more at something like 80%, especially if you are trying to use as a portfolio or print – say as display or print at a fine art or other site. With the retina and HD displays some screens are more than 72 dpi for display purposes. Also another comment – I would always keep my metadata, as it can come in handy for a number of reasons. One reason is if you are interested in what your settings were for a particular shot but forgot, especially for beginners. Another reason is tags (i.e. keywords) can be stored in metadata which some sites can read and use, so it can help with your SEO. Lastly, contact information – always make sure your EXIF is loaded with it. Watermark or not, (which is a sometimes hotly debated subject) can be cropped, or photos passed around, and having the original author and possibly email / website embedded can help. Although the EXIF info can of course always be modified and deleted by software and on purpose by thieves. So IMHO I would only downgrade my resolution using 90% or lower compression on files that will NEVER be printed and ONLY displayed on sites like Facebook which compress the heck out of your files anyway. I’d prefer to link to important photographs from sites like Facebook so users can see more resolution and color. And always keep your metadata – i.e. EXIF – intact. Good article Nasim! i would agree with some of the other commenters though that if you are planning on ever printing your files, export at 100%! Storage is cheap nowadays! Thanks for the blog! thank you, thank you, thank you! I just could not get sizing and sharpness right until i read this on exporting for my blog. Food photos are going to look much yummier from here on out! Hi! Thank you for this post, super helpful. You may have already answered this, but I’m looking to give clients both social media sizes and print sizes. When exporting, what are the best resizing settings to use for each? I want to maintain the rich colors in the photos. I see that 1024 is best for social media, what about print? Should I change any of the other settings? HI. We have been using Lightroom for sometime now but now we have a problem because we have a specific image dimension requirement for a certain website. The image dimension should be 762 pixels x 1100 pixels. We set the image to come out in these dimension. But then when everything were already imported and done, the image finished wt 732 pixels x 1100 pixels. Where did we go wrong in the process? Please help. Thank you. This was precisely what I was looking to do in Lightroom. Thank you. This was a great help. I will print my photos on a photo book but I do not know which option in “Resize to Fit” should I choose and what numbers should I pick. Can you help me? Hello! Thank you for this article… I’m wondering if the export settings you recommend would help with load-time for portfolio/gallery pages on a WordPress website? I’ve found that my images are probably too large and my site doesn’t load very quickly. I’d like to correct this but it’ll be a time-consuming job and want to make sure my export settings will help remedy this problem. I was also wondering if you could tell, if I can use this same image sizing when sharing pictures to friends (usually thru Dropbox). I’m travelling and always acting as the photographer during travels and small projects along the road, but never really sure which sizing I should choose when sharing the pics? Would the 1024-1080px long edge and 72 resolution work for this purpose as well? And would you have any other alternatives than Dropbox to recommend, as sharing /sending pictures from projects very easily sill stayin organised? This is so incredibly helpful! I have a food blog and have been struggling with images that are too large and slow my site down. Thanks so much for the step-by-step instructions! Haha – just yesterday I had a phone conversation with the woman who did my web-site. She then told me “I am going to show you how to resize your pictures for the web”. For years I didn’t know. So I googled and thought I want to be proactive. Many articles I found on the internet but this one really caught my eye and wow it is well written and excellent. Finally I know it – finally I will do it. I could have learned it back in 2014. Great post! I have a question though, let’s sya I have a picture that’s 1300×700 and 250kb, then I do the process with lightroom where I reduce the size to 800×600 and do the 80 quality. But the end result will actually be a larger picture. Is lightroom adding something extra that I can opt out of? Thank you for the info! I just used it for my first shoot. Very helpful. I want to submit some photo’s for a local photography competion but I need to crop and sharpen some of them. They have to be 800kb in size to submit but if selected must be at least 8mb. I have lightroom and photoshop but can’t figure out how to do it so I can retain larger file size. can you help? nice article mate! always keep it up! Thank you for this wonderful article on resizing images. When I export and resize the image, I used the option from the drop down as Width & Height and I save it as 1024*768 pixels. However when the image is saved and when I check the dimensions, it gets reduced to 1024*663 or 1024*592 etc…. Thanks so much, Nasim! This tutorial is spot on and easy enough for a novice like me to follow. Worked like a charm and severely cut down my editing and compression workflow time. Hi, Just found your great article on The image resizing workflow. Thank you. Include, and the first choice of 4 says Copyright only, and the other 3 choices. Under this are 2 more boxes, one saying Remove Person Information, one saying Remove Location Info and one saying Write Keywords as LR Hierarchy. 2nd question: do you have an article or specific information on resizing images for printing? I am trying to resize almost 300 images at one single time to fixed dimension of 630 X 960. I tried doing it but the size keeps changing.I am trying to upload for a website in fixed dimension. This article has been enormously helpful as I am trying to compress images to go on my new website. Following your step-by-step instructions, I have been able to do this through Lightroom and haven’t lost the clarity of the image. Yippee. I have one outstanding problem that I’m hoping you can help me with: the image spaces are preset to 600×400. So I set these dimensions in Lightroom, but on exporting I notice that the dimensions are not exactly this size, which means there may be white margins around images. Is there a reason for this, or am I just doing something wrong. I would really appreciate your advice on this. Many thanks, Bron. How can I change the size to fit an 8 x 10 without if cropping the image? This tutorial was a wonderful help! Thank you so much!!! Thanks so much for this article Nazim! I was struggling with figuring out how I should set up my images for my website. This was very helpful, thank you. One question that is probably a silly one: If I am already significantly cropping my photo in LR, does that take care of this resampling/downsizing? Or is there benefit to doing this downsampling process on the cropped image? I took photos for someones head-shots for their website. They asked me to make the photos 255 X 255 pixels. I followed the steps above but when I export, the photo becomes just a little blurry. How would I fix this issue?